Southern Pine Counci l write-up- “Since 2005, the Southern Pine Council (SPC) has presented its Long-Sullivan Award, recognizing a building or design professional who has demonstrated outstanding use of our products. This year, a committee of six SPC members reviewed five very strong nominations: submissions from a custom homebuilder, three architects and a custom deck builder. After careful consideration, the 2011 recipient is John Paulin, owner of Tailor Decks in Statham, Georgia. His designs feature a custom-milled decking product called ‘Tailored-Wood’, with a top surface crowned slightly to shed water and help prevent cupping. Both sides are beveled, too, allowing water and debris to pass freely between deck boards. On the underside of each piece, he includes a relief cut to further reduce checking and cupping. John brings these same innovations to his porch flooring material, railing posts and rail caps. 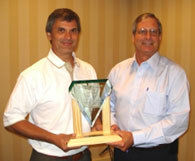 Home Reports Best Pick Deck Contractor in Atlanta metro area for 12 years. Click here to read John Paulin’s article about Open Air Decks recently published in Remodeling Magazine. 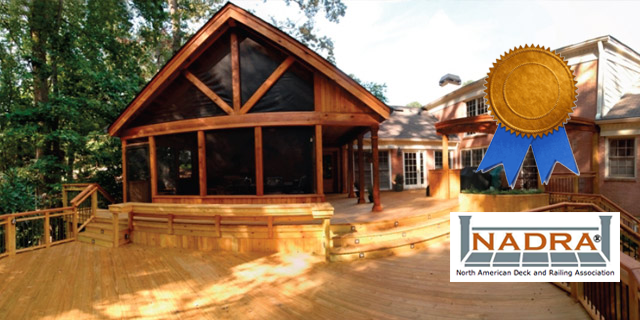 Click here to read John Paulin’s article about Wood Decks that Last recently published in Professional Deck Builder Magazine.